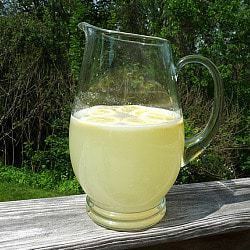 Stir together lemon juice and sugar in a 3-quart pitcher until sugar is dissolved. Add water and stir until combined. Garnish with additional lemon slices and mint, if desired. Serve over ice in glasses. *Note: You can refrigerate the lemonade if not serving immediately; stir before serving.